The fact that the Roman legions of Caesar’s time moved across the seas on ships with leather sails gives some idea of how long leatherworking has been of use to mankind. But leather’s history goes back far beyond the period of the Roman Empire. Leather’s origins are rooted in prehistoric man’s first use of untreated wild animal skins as clothing. Probably the skins were worn in the belief that the strength and ferocity of an animal were transferred to humans who wore his skin. Skins were also worn by hunters to disguise them from their prey. As methods for preserving raw animal skins developed, leather as we know it began. Bas-reliefs from ancient Egypt, dating back to 4000 B. C. depict leathermakers at work. The carvings show that leather processing (probably with vegetable juices) had been known about at a very early date. One of the oldest known “tanning” or preserving formulas for leather comes from ancient Babylonia, where raw animal skins were treated in allum, gallnuts, myrrh, oil, and sumac to make them durable. Early leather was undoubtedly crude and took a long time to make, but it was still a very much used material. Though we would never imagine modern America Cup yachts having leather sails, the Vikings and ancient Romans equipped their war ships with them, probably because leather was the strongest material available for the job. The strength and durability of leather were also probably the reasons that the Sumerians, in 3000 B.C., made tires for their chariots out of leather. Other peoples, including the American Indian, Australian aborigine, and primitive tribes of Africa and South America, also found that the toughness of leather made it suitable for shields, armor, and shelter. Leather storage vessels of all types-for grain, wine, water, tools, and household utensils- have been found in archeological excavations in Greece, Egypt, Britain, and the Near East. In some cases, they date back to Neolithic times. Interesting, too, are the leather shadow puppets, common in the Far East and South Sea Islands, which are perforated with tiny holes that produce a delicate, lacy shadow when a light is placed behind them to project their outlines onto a screen. Mystical associations with leather are shown by the use of leather for religious fetish figures, notably by African tribes and the sinister voodoo cults in Cuba and Haiti. 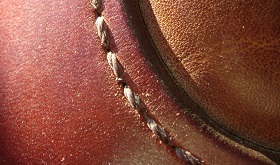 By the time of the discovery of the Americas, leather was in widespread use throughout the world. In Europe, leather was being produced primarily by curing the skins in solutions made from the bark of various trees such as the oak, birch, and hemlock. The first European settlers in America had brought leather with them. But shortly after becoming established, they built the first tannery in the New World in 1623. As leather production in America grew, leather became widely used for everything from harnesses, saddles, clothing, and rope to window panes. Leather was in such demand all over the world in the 19th century that in California, during the Spanish and Mexican periods, cowhides were one of the principal commercial exports and were even considered a form of money.